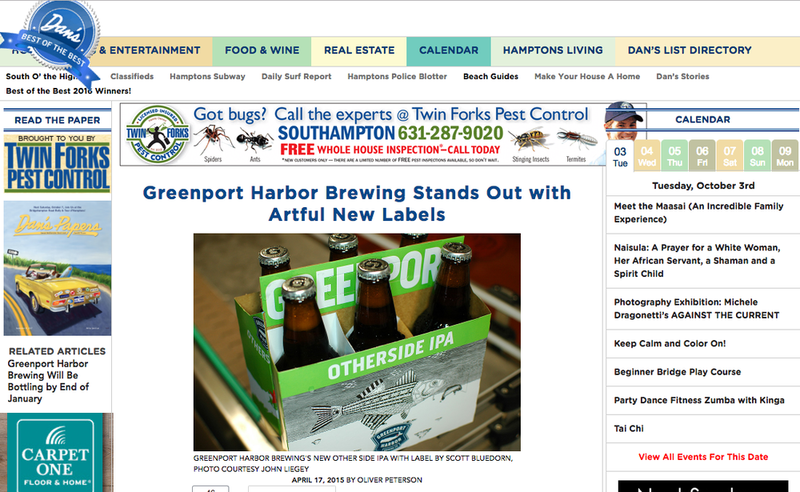 Just in time for the holiday season, Greenport Harbor Brewing Company has opened its latest exhibition. Titled “Off the Hook,” the exhibition will showcase the artwork of Elaine Jensen Steele. Elaine Jensen Steele draws from her years as an avid surfer, as well as her travels around Southeast Asia, to create bright, colorful renderings of the spectra of aquatic creatures that populate our waters. Beginning as a hobby to recycle scrap wood being thrown out helping her brother build furniture, Steele started to decorate her home with the colorful panels. Taking aesthetical cues from street art, Steele works with acrylic and aerosol paints, juxtaposed against the grain of the wood, to accentuate the boldness of her colors. Pieces are currently available for purchase in the Greenport tasting room for holiday gifts. “Off the Hook” is currently on view at Greenport Harbor Brewing Company until February 24, 2019. An artist reception will be held on Saturday, January 19, 2019, from 6 to 8 p.m. at the brewery’s location at 234 Carpenter Street, Greenport, NY 11944. Tasting Room Hours: Friday & Saturday 12-8 pm; Sundays 12-7 pm. SCOTT BLUEDORN'S LIMITED EDITION PRINTS AVAILABLE AT OUR PECONIC LOCATION! NOW DISPLAYING THE AWARD-WINNING ART OF STEPHEN PALMER IN OUR BREWPUB! Greenport Harbor Brewing Company is proudly exhibiting the artwork of Stephen Palmer of Traverse City, Michigan at our Peconic location. His award winning mixed-media fish sculptures are currently on display in our restaurant. The artist creates these incredible assemblage pieces with found objects and he hopes people will see the connection between his use of things that might otherwise be discarded and the pollution of our waterways. An annual percentage of the sale of Stephen’s fish helps support environmental groups. These robots are handmade individually by artist Mark May from recycled materials. GHBC bottle caps included!